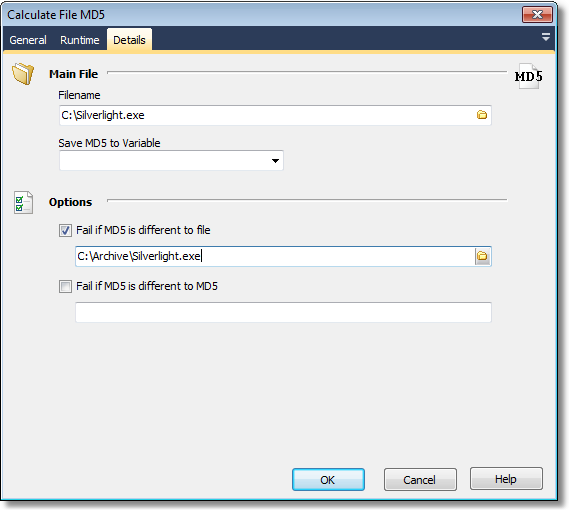 The File MD5 action enables you to automate the calculation of a file's MD5. The action can also fail if the MD5 differs from another file or a specified MD5. The MD5 algorithm takes as input a message of arbitrary length and produces as output a 128-bit "fingerprint" or "message digest" of the input. It is conjectured that it is computationally infeasible to produce two messages having the same message digest, or to produce any message having a given pre-specified target message digest. The MD5 algorithm is intended for digital signature applications, where a large file must be "compressed" in a secure manner before being encrypted with a private (secret) key under a public-key crypto system such as RSA. In essence, MD5 is a way to verify data integrity, and is much more reliable than checksum and many other commonly used methods. Filename - specify the file which you want to calculate the MD5 for. Variable - specify the FinalBuilder variable to save the calculated file MD5 to. Fail if MD5 is different to file - this calculates the MD5 of the specified file and compares it against the MD5 of the main file and fails the action if the two differ.